Avicennia africana P.Beauv. Avicennia nitida Jacq. Avicennia tomentosa Bontia germinans L.
^ "Avicennia germinans". JSTOR. Retrieved 2019-04-24. ^ Madrid, Eric N.; Armitage, Anna R.; López-Portillo, Jorge (2014). 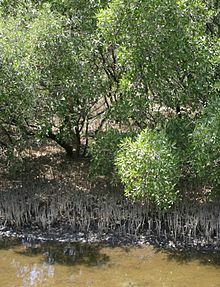 "Avicennia germinans (black mangrove) vessel architecture is linked to chilling and salinity tolerance in the Gulf of Mexico". Frontiers in Plant Science. doi:10.3389/fpls.2014.00503.